I'm trying to give new life to my old white late-2006 MacBook by installing a new OS (dual boot), but I am having problems as my DVD/CD drive is broken and I just can't get my Mac to boot from my flash drive. The Mac has 64 bit processors, but the EFI is 32 bit. I previously tried (and succeeded) installing Windows 10 with the help of VirtualBox following this incredible guide, but finally decided to drop that solution as I couldn't get the sound to work (everything else worked like a charm though). 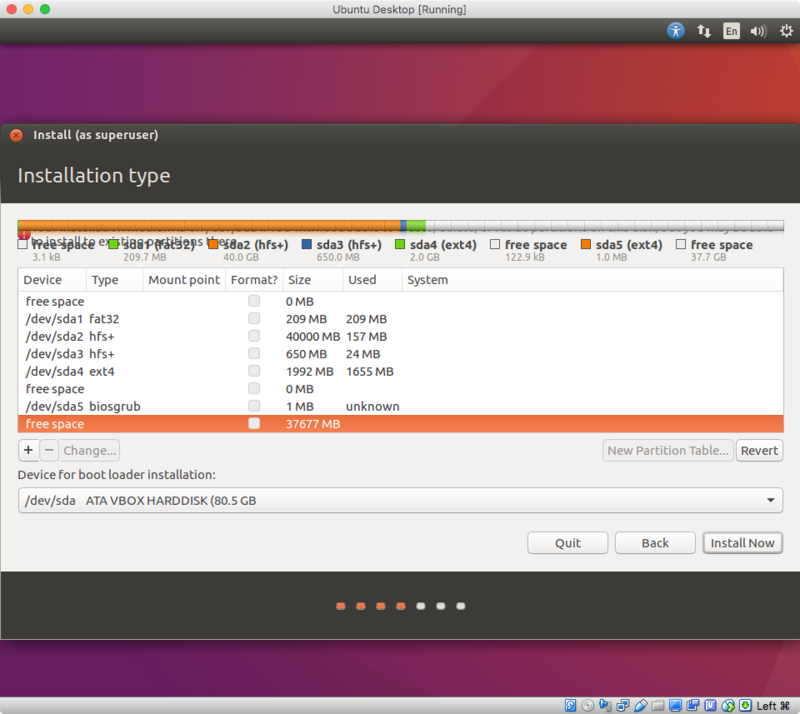 So, I would instead like to give 64 bit Ubuntu a try. 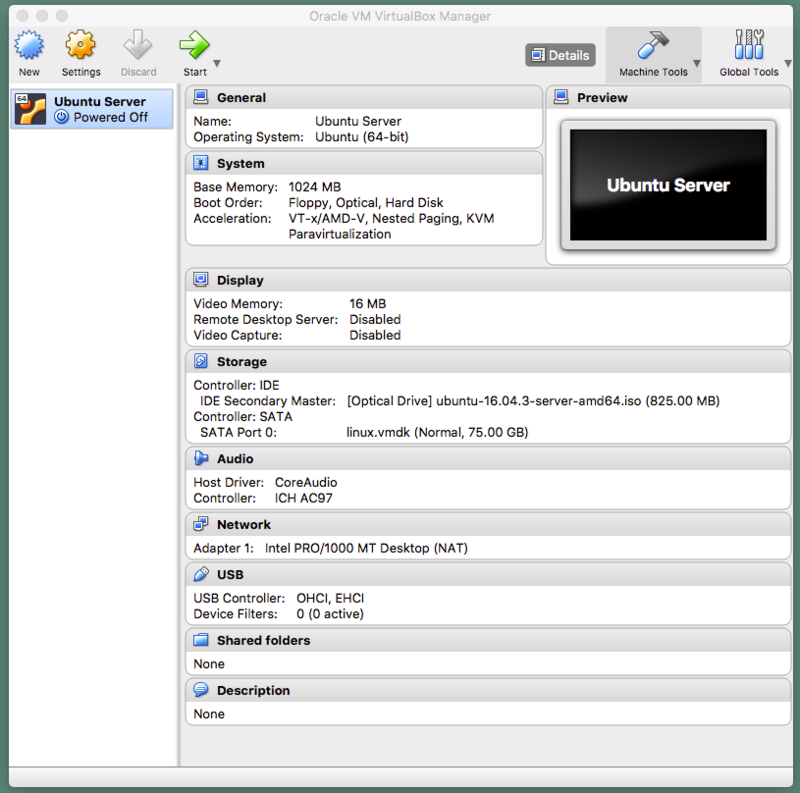 Could a similar approach, using VirtualBox as in the guide above, be used to install Ubuntu without USB or DVD, or would access to the physical disk via VirtualBox be a limitation? I'm currently running OSX 10.7 Lion and VirtualBox 4.3.40. My Objective is to post a procedure that would allow you to boot a Ubuntu Desktop Live. Once you have booted, you could then install the regular Ubuntu Desktop. The only way I can figure out how to boot Ubuntu Desktop Live is by using GRUB. The problem is I can not determine a way to install GRUB without first installing some version of Linux. 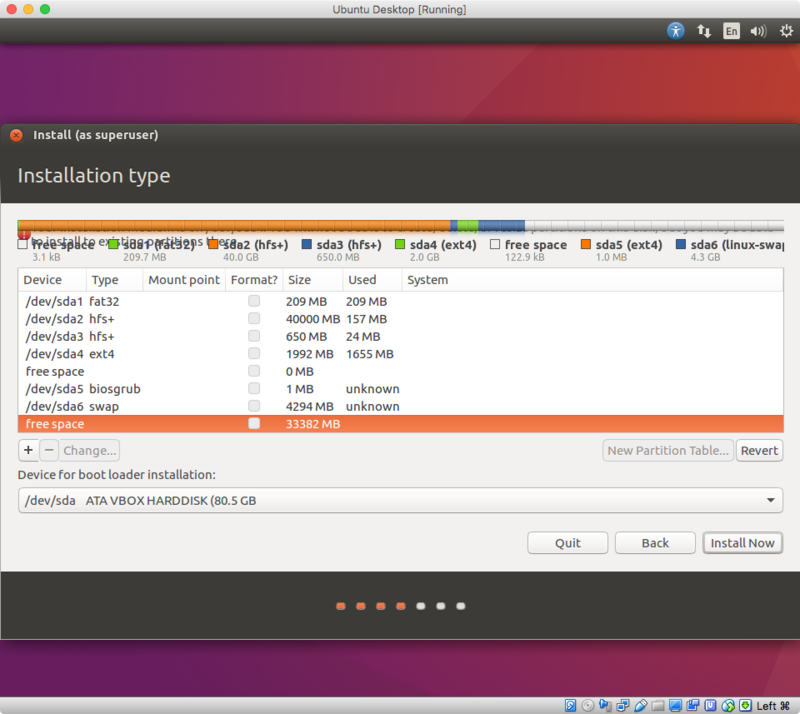 In this case, I choose to install Ubuntu Server inside a VirtualBox machine. This machine was configured to use a subset of the Mac's physical HD partitions. 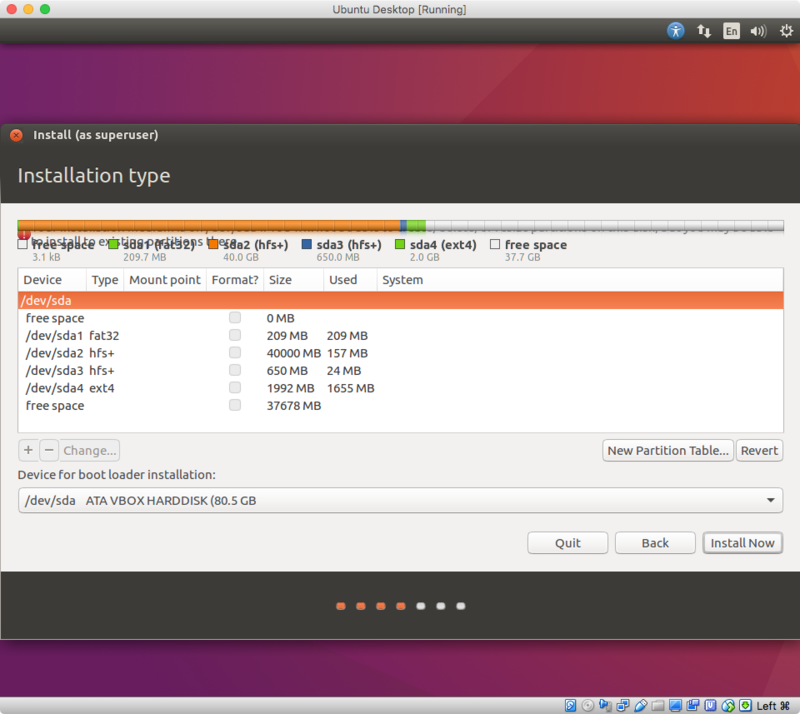 Once GRUB was installing in these partitions, Ubuntu Desktop Live could boot without using VirtualBox. To start I will assume your current hard disk is configured as shown below. The command below will create approximately 40 GB of free space at the end of your internal disk. This command will automatically relocate the disk0s3 partition. The results can be summarized by the output from the diskutil list command, shown below. 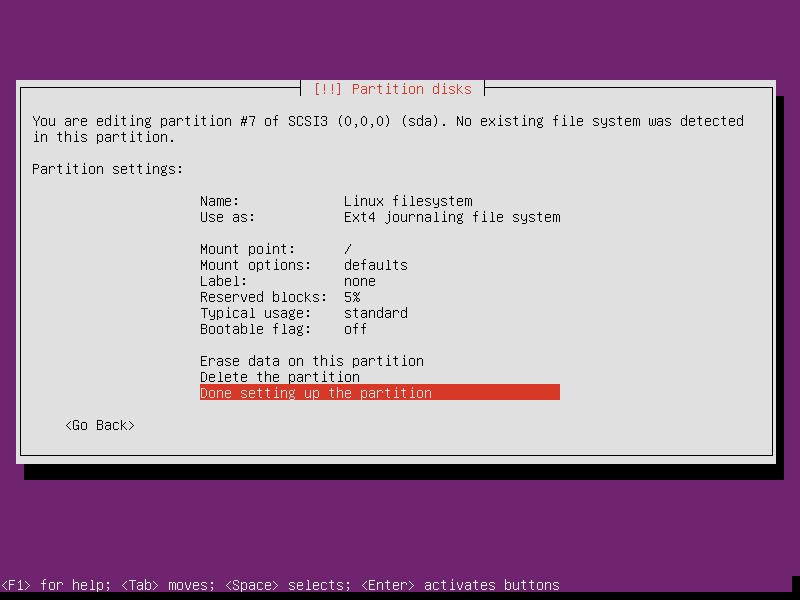 Before using VirtualBox, all new linux related partitions have to be created. I choose the third party tool gdisk to create the partitions. Below is a list of the partitions that need to be created. 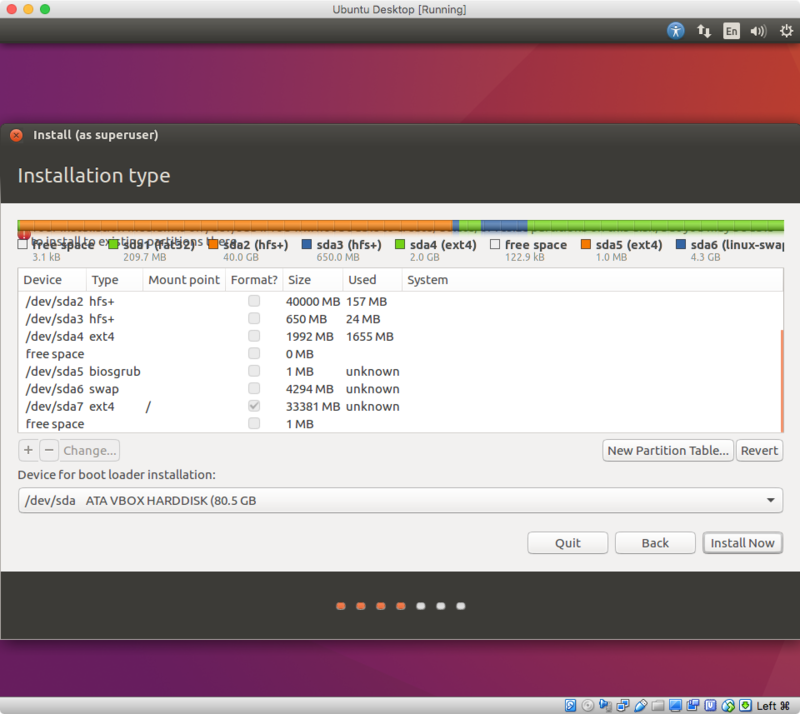 1.9 GB partition to hold the contents of the Ubuntu Desktop Live iso. 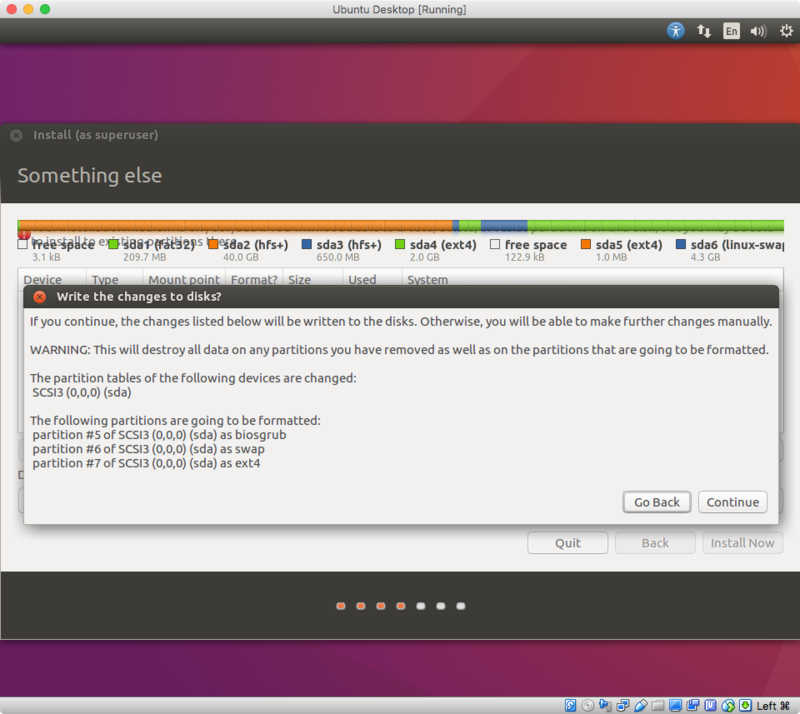 This will allow you to replace Ubuntu Server with Ubuntu Desktop. 1 MiB Bios Boot Partition to hold GRUB boot code. 4 GiB Linux Swap Partition. This was chosen to be the same size as your RAM. The remaining space to be allocated for Ubuntu files. The output from using the gdisk /dev/disk0 command to edit the GPT is given below. Note: It would be a good idea to restart the Mac. The output from the command diskutil list is shown below. This includes the new partitions created by using gdisk. Create folder named "VirtualBox" in your Documents folder. 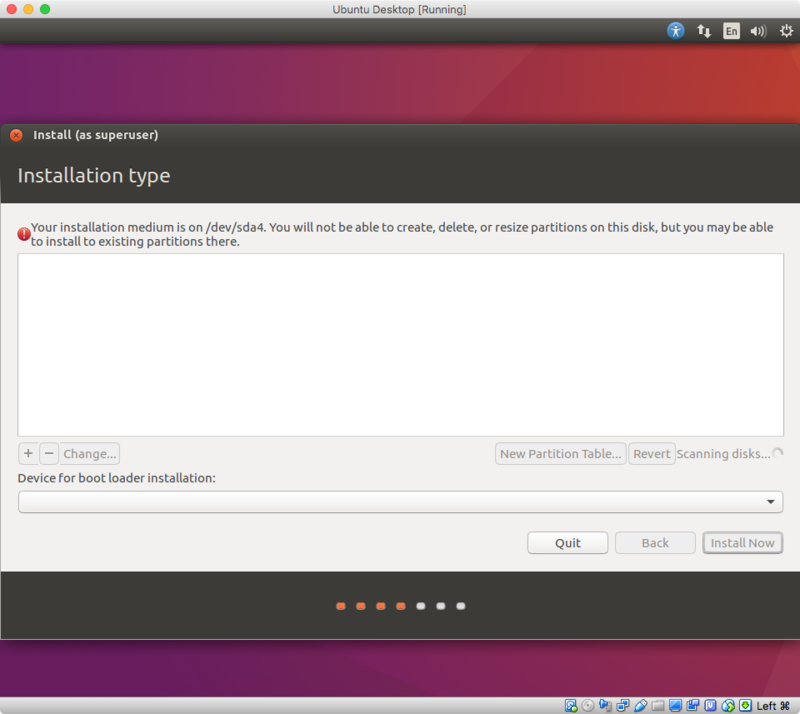 This step will create the files needed by VirtualBox to access the physical partition where you will install Ubuntu. In a Terminal application window, enter the following commands. The result should be the creation of the files linux.vmdk and linux-pt.vmdk in your "VirtualBox" folder. 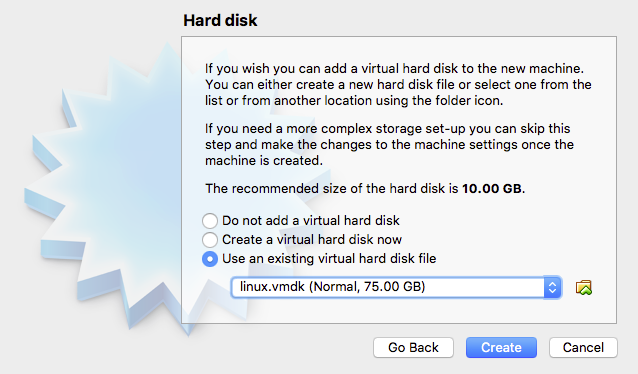 Later, you will select the file linux.vmdk to give a virtual machine access to the physical partitions. Use the default settings except for the hard drive. Choose the "Use an existing virtual hard drive file" button. Navigate to your "VirtualBox" folder. Highlight the linux.vmdk file. Open the linux.vmdk file. Your window should appear similar to what is shown below. 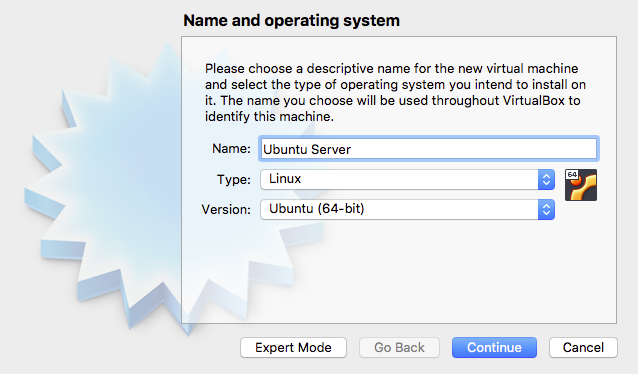 After returning to the VirtualBox application's "Oracle VM VirtualBox Manager" window, click on the icon above the "Settings" label. Next, click on the icon above the "Storage" label. 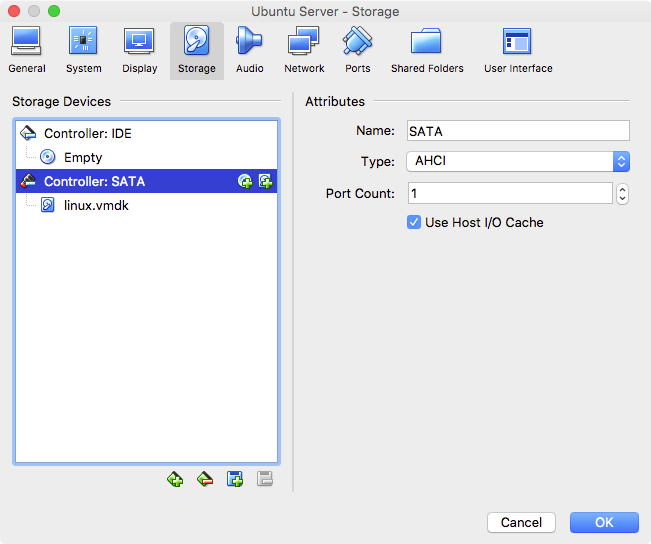 Highlight "Controller: SATA" in "Storage Devices", then select the "Use Host I/O Cache" option. Your window should appear similar to what is shown below. Click on the icon above the "Start" label to boot from the "ubuntu-16.04.3-server-amd64.iso" file. You can proceed with the installation by choosing the default values until you reach the image shown below. Here, you should choose "Manual". Select #6, as shown below. Select "Use as:", as shown below. Select "swap area", as shown below. 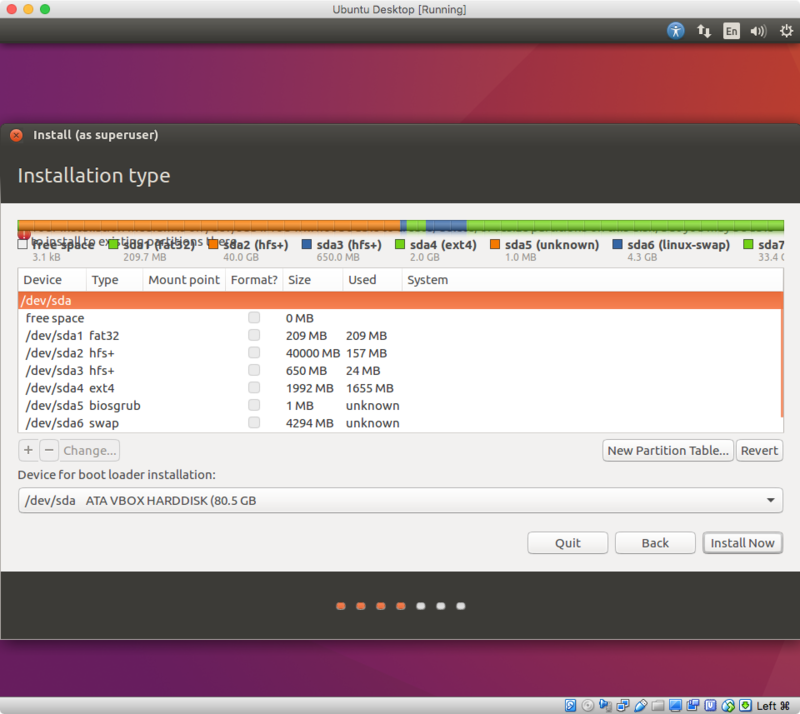 Select "Done setting up the partition", as show below. Select #7, as shown below. Select "Ext4 journaling file system", as shown below. Select "Mount point:", as shown below. Select "/ - the root file system", as shown below. 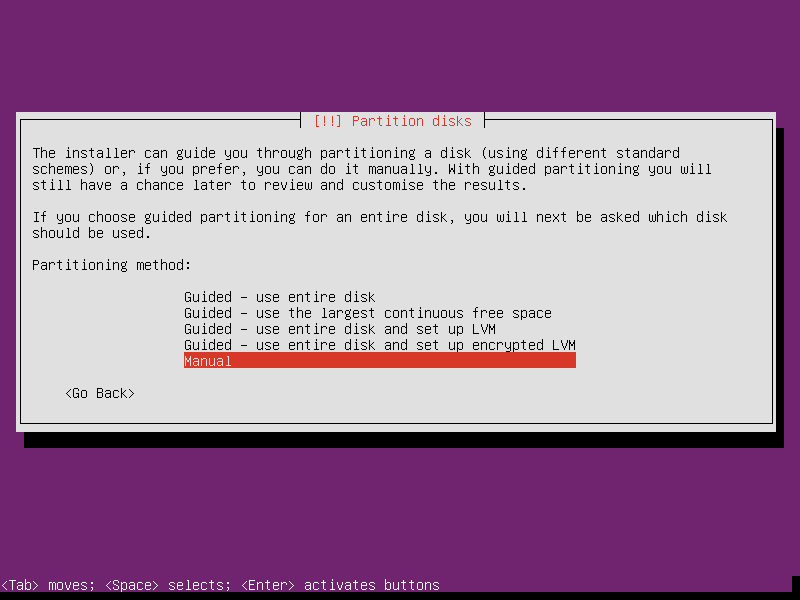 Select "Finish partitioning and write changes to disk", as shown below. Select "Yes", as shown below. 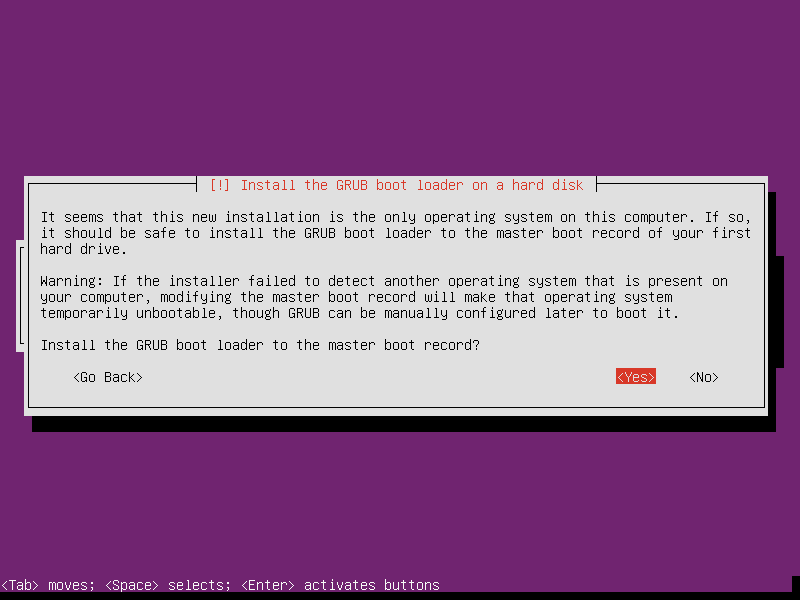 When prompted to "Install the GRUB boot loader to the master boot record? ", select "Yes", as shown below. The install should proceed to completion. Using VirtualBox, boot to Ubuntu Server. After logging in, enter the command below. This will give you root user privileges. 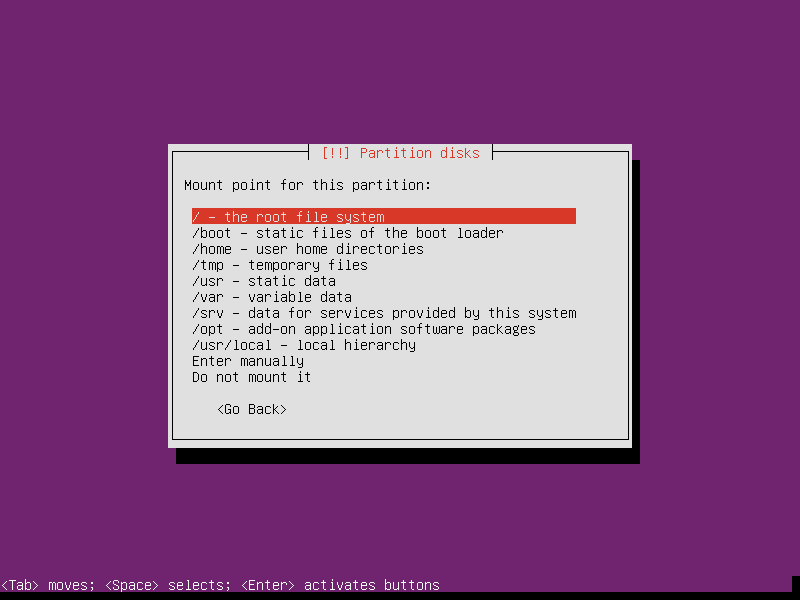 Copy the MBR to an unused sector in the BIOS boot partition. 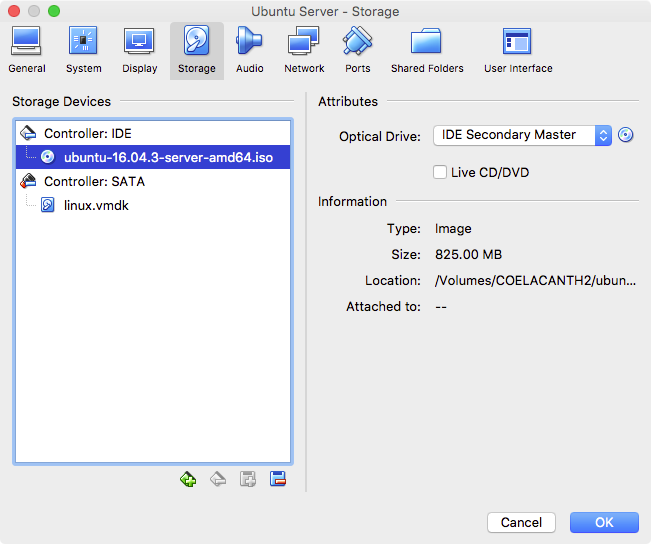 Insert ubuntu-16.04.3-desktop-amd64.iso into the virtual DVD drive. Enter the commands given below to copy the files from the iso to the hard disk. Note: The rsync command may take a while to complete. Configure GRUB. Start by entering the following commands to edit the 40_custom file. Add the following lines to the end of the 40_custom file. 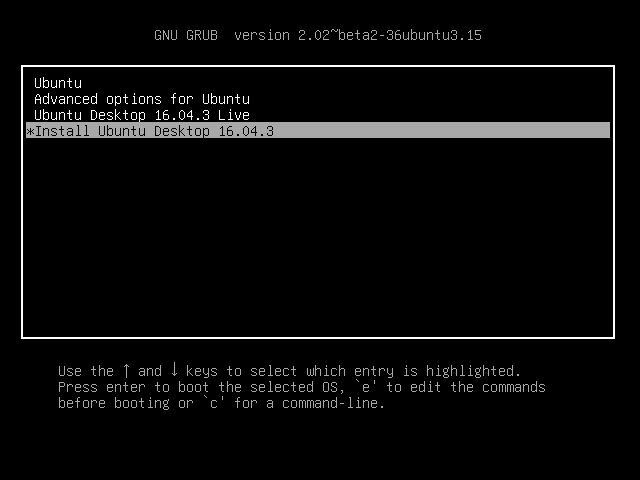 This will create Ubuntu Desktop Live and Installation entries in the GRUB menu. After saving your changes to the 40_custom file, enter the following commands to edit the grub file. Find the following line in the grub file. Change the line to appear as shown below. After saving your changes to the grub file, use the following commands to update grub and return to your home directory. Exit being the root user and shutdown the virtual machine. Copy the MBR GRUB boot code from the BIOS boot partition to the MBR. Convert to a Hybrid MBR/GPT scheme. The only reason for this step is to get around a bug in the Mac logic board BIOS firmware. Basically, the BIOS will not load the MBR into RAM unless there is an active partition in the MBR table. This conversion can be easily accomplished through the use of the interactive command shown below. The output from using this command is shown below. Note: As the above message states, It would be a good idea to restart your Mac. Use the bless command to set your Mac to BIOS boot. After properly blessing your Mac, restart to boot GRUB. You should get an image similar to what is shown below. Select "Install Ubuntu Desktop 16.04.3". Install until the message shown below appears. Shortly, after this message is displayed, the window will be populated by partition information. This information will obscure this message. The window, with the partition information, will appear similar to what is shown below. This message is wrong. The message clearly says "You will not be able to create, delete or resize partition on this disk." Well, this is exactly what we will be doing. Delete the last 3 partitions. Select a partition, then select the - character. Repeat for the two remaining partitions. The result should appear similar to what is shown below. Add back the desired partitions, I choose the same as was deleted. You may want something different. Perhaps a LVM? Select the free space as shown below, then select the + character. Set the popup window as shown below, then select "OK". Set the "Mount point" in the popup window, as shown below, then select "OK". Note: Do not change the "Size:" value. Your value may be different from what is shown below. The final results are shown below. To proceed with the installation, select "Install Now". Select "Continue". Let the installation proceed to conclusion. To boot back to OS X, you need to hold down the option key at startup. You will probably want to use rEFInd as your boot manager. I made the swap space 4 GiB, because I read this is the amount of RAM installed. Upon review, I see only 3 GiB is usable. A little extra swap space probably is nothing to be concerned over. If you wish, you could make adjustments to my posted installation procedures. There is no reason for readers to look up any of these references. They appear here for my use. Can I boot a Live USB fully to RAM, allowing me to remove the disk? This answer address your attempt to install Windows 10. All Mac models through the 2007 model year, which could run Windows, did so using the BIOS boot method. All the drivers included in the Boot Camp Support Software (BCSS) were design for a BIOS boot. If one was able to achieve a EFI boot, they usually were rewarded with the failure of one or more hardware devices. The BCSS you downloaded using the Boot Camp Assistant should have been the same as from the website Boot Camp Support Software 4.0.4033. You should use this software regardless of a 32 bit or 64 bit install and for Windows 7 through Windows 10. I have a 17-inch, mid 2007 iMac, which also uses the same BCSS. I have successfully installed 64 bit Windows 7, 8 and 10. If you install a 64 bit version of Windows, you might have trouble installing the BCSS. Basically, Apple inserted a scarecrow application to fool you into thinking you can not run the installer. Once you bypass this application, the Boot Camp Support Software should not have any problems installing. This bypass procedure is outlined at this Ask Different website. Not the answer you're looking for? Browse other questions tagged macbook lion unix virtualbox . Can't I resize my existing partition? MacbookPro Won't Boot without Live USB-Key. Screwed up bootloader?